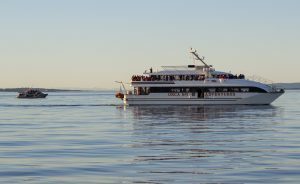 When people think of going whale watching near Victoria, they often anticipate seeing large whales like humpbacks, orcas and grey whales. But there are much tinier cetaceans out there that are just as fascinating and fun to watch- the porpoises! Whale watching off of Victoria provides an excellent opportunity to spot two different species of porpoises known as Harbour and Dall’s porpoises. These two species are very different from each other in both physical appearance and behaviours, yet they are known to mate and have viable offspring. Porpoises are often mistaken for dolphins but they are actually very different types of cetaceans. Dolphins tend to be much larger than porpoises and have that characteristic dolphin “beak”. Porpoises have shorter, robust bodies and have a rounded face similar in shape to an orca. The word porpoise means “hog fish” or “sea hog”. Dolphins have large, conical-shaped teeth while porpoises have very small, flat teeth that are spade-shaped. These differences allow them to fill very different niches in the same environment. Harbour porpoises are the smallest cetacean found in British Columbia’s waters, reaching less than 2m in length and weighing up to 60 kg. They tend to surface slowly and do not engage in high-speed swimming unless they are being hunted by Transient orcas. Dall’s porpoises, on the other hand, are larger than Harbour porpoises, weighing up to 200 kg and they are among the fastest swimmers of all cetaceans. 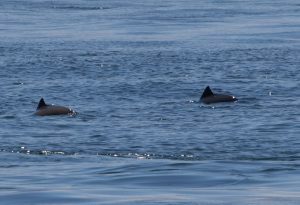 Even a new whale watcher can quickly learn to identify these two species from each other because Dall’s porpoises generate a “rooster tail” when they surface which is a fan of water that sprays off their dorsal fin. 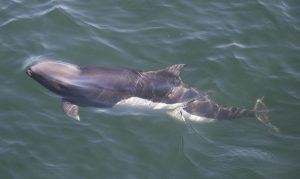 Dall’s porpoises will often ride the bow waves from vessels whereas Harbour porpoises tend to be vessel shy unless they are engaged in foraging. Something that most people don’t know is the fact that these two very different species of porpoises actually interbreed with each other! Observations reveal that the Harbour porpoise is often the father and that the offspring, which is often born to a Dall’s mother, behaves like a Dall’s porpoise as they are raised only by their mother. It is easy to spot a hybrid porpoise because they will have an odd colouration pattern that does not match either species. What is even more interesting is that the hybrid offspring are viable, meaning that they are capable of reproducing. This is not always the case in the animal kingdom. For example, horses and donkeys can mate and reproduce, but the offspring which we call a mule is sterile. It is not uncommon for us to see hybrid porpoises when groups of Dall’s porpoises are in the area. Another fascinating fact about porpoises is that they have evolved to vocalize above the hearing range of their predator, killer whales! Porpoises mostly vocalize in the form of echolocation clicks. The frequency of their vocalizations is so high that we once that they could not vocalize. With sophisticated acoustic equipment, scientists have discovered that they do indeed produce sounds, but like orcas, humans cannot hear them. Dall’s porpoises are known to vocalize between 120-140 kHz, and have been recorded vocalizing as high as 200 kHz! To put that into perspective, the range of human hearing is between 20 Hz to 20 kHz and orcas have a hearing range between 1 and 100 kHz. Nature is always in a constant state of adaptation to the ever-changing environment. Prey species evolve to avoid their predators and predators are constantly evolving to be better at detecting and catching their prey. We are fortunate to have the opportunity to watch these adaptations in action while we are out on the water! If you want to see our local Victoria porpoises, you should consider taking one of our whale watching tours during high viewing season between May and October, for more information go to our whale watching page.